A huge sunspot that dwarfs the Earth is unleashing a series of powerful solar flares as it moves across the surface of the sun, NASA scientists say. The sunspot AR 1476 was detected by space telescopes on May 5. The huge sunspot is 60,000 miles (100,000 kilometers) across, so large that when it was first seen in views from NASA's Solar Dynamics Observatory spacecraft, mission scientists dubbed it a "monster sunspot." Earlier this week, space weather scientists predicted the sunspot would erupt with powerful solar flares, and those predictions have since come true. So far, the sunspot has fired off several flares, including a strong solar storm early Thursday (May 10). On Thursday, sunspot AR 1476 unleashed a powerful flare at 12:18 a.m. EDT (0418 GMT) that registered as a class M5.7 eruption. M-class solar flares are medium-strength sun storms that can still unleash powerful blasts of radiation and magnetic solar plasma. So far, the sunspot has not triggered huge explosions from the sun, which scientists call coronal mass ejections. On the scale of solar flares, X-class storms are the most powerful and can interfere with satellites and infrastructure on Earth when aimed at our planet. M-class storms are the second-most powerful flares and can set off geomagnetic storms that create dazzling northern lights displays when the eruptions reach Earth. C-class flares, the weakest category, have little effect on Earth. NASA officials said the Thursday solar storm is just one of many to erupt from the massive sunspot. 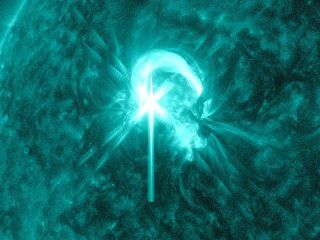 "The sunspot, dubbed Active Region 1476, has so far produced seven M-class flares and numerous C-class flares, including two M-class flares on May 9, 2012 that peaked at 8:32 EDT and 10:08 EDT," the space agency wrote in a Thursday space weather update. "These flares were all short-lived and there were no associated coronal mass ejections, so we do not expect any geomagnetic storms at Earth," NASA officials added. That means a supercharged northern lights display from the recent solar storms is currently unlikely. Another NASA account stated that the sunspot has unleashed as many as 32 solar flares so far. It will take sunspot AR 1476 about two weeks to complete its trip across the face of the sun, as seen from Earth, NASA officials said. The sun is currently in an active phase of its 11-year solar weather cycle. The current cycle, known as Solar Cycle 24, will peak in 2013.